Patrick Zickler is a Contributing Writer for NIDA	NOTES. For obese smokers, the taste and smell of a lit cigarette may play as powerful a part in addiction as does the nicotine buzz. For these smokers, nicotine replacement therapies that also replace some of the sensory aspects of smoking—lozenges, gum, or nasal spray—may be more effective than a patch, according to researchers at the University of Pennsylvania's Transdisciplinary Tobacco Use Research Center (TTURC). Lead investigator Dr. Caryn Lerman and TTURC colleagues asked 37 smokers to describe the experiences of smoking two "brands" of cigarettes; although the smokers did not know it, one brand contained nicotine and the other did not. 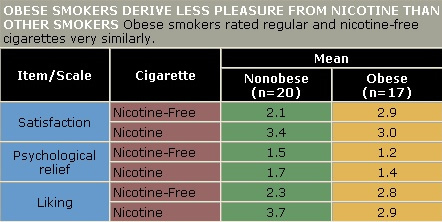 Obese smokers rated the two nearly equal, while nonobese smokers gave higher marks to the conventional cigarettes. When allowed to choose freely, nonobese smokers preferred conventional cigarettes, while obese smokers were equally likely to choose either type. To validate these observations and investigate their physiological basis, Dr. Julie Blendy and colleagues tested nicotine's rewarding effect in mice. Given access to two chambers, nonobese mice gravitated to the one in which researchers had dosed them with nicotine, whereas mice made obese by a high-fat diet showed no preference. These results suggest that the nicotine provided the nonobese mice, but not the obese mice, with an experience they wanted to repeat. When the researchers examined the brains of the mice, they found that the obese animals, compared with those fed a normal diet, had reduced levels of opioid receptors, which have been implicated in nicotine addiction. "For obese smokers, sensory cues such as sights and smells and taste may be at least as rewarding as the pharmacological reward of nicotine," says Dr. Lerman. "The mouse experiment suggests a possible biological mechanism for the observation in human smokers. Diet may influence nicotine reward through effects on the opioid system," Dr. Blendy adds. 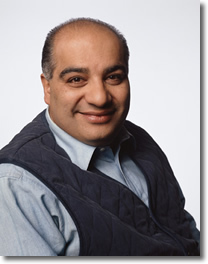 The research team recruited 17 obese and 20 nonobese men and women who were regular smokers. The obese and nonobese study participants' average body mass indexes were 39.1 (range, 31.0 to 59.4) and 23.0 (range, 18.3 to 26.3), respectively. In the first part of the study, the participants smoked one cigarette from each of two color-coded sets, one that contained nicotine and one that was nicotine-free, without being informed about the difference. Participants rated the two smokes on a scale ranging from 0 (none) to 7 (complete)—for "satisfaction," "liking," and "psychological relief." On average, obese smokers gave the conventional and nicotine-free cigarettes almost identical ratings for satisfaction (3.0 for nicotine versus 2.9 for nicotine-free), liking (2.9 versus 2.8), and psychological relief (1.4 versus 1.2). Nonobese smokers gave the conventional cigarettes higher ratings for satisfaction (3.4 versus 2.1) and liking (3.7 versus 2.3) and showed no significant preference in psychological relief (1.7 versus 1.5). Next, the smokers were allowed to smoke cigarettes from either color-coded set in four sessions, spaced 30 minutes apart, but limited to four puffs per session. On average, obese smokers took as many puffs on the conventional (48 percent) as the nicotine-free (52 percent) cigarettes. Nonobese smokers took 70 percent of their puffs from the conventional cigarettes. "Tobacco addiction involves an interplay of physiological influences, such as the effects of nicotine or other components of tobacco, with sensory influences associated with taste or aroma, the physical manipulation of cigarettes and lighters, or the sight of smoke," Dr. Lerman says. "It appears that for obese smokers, non-nicotine factors play a considerable part in maintaining addiction and therefore need to be considered in developing a treatment to help obese smokers quit. Obesity and smoking are both serious health risks, and some research suggests they act synergistically to create an even greater risk. If so, helping obese smokers to quit may have a greater impact on public health than an equivalent cessation among nonobese smokers." In the animal component of their investigation, the researchers simulated human obesity in mice by feeding them a high-fat diet (45 percent fat, 35 percent carbohydrates, 20 percent protein) for 15 weeks. A control group of mice received a normal laboratory diet (12 percent fat, 60 percent carbohydrates, 28 percent protein). The researchers injected each animal with nicotine while confining it to one compartment of a two-compartment test chamber daily for 8 days. Subsequently, they placed each mouse in the test chamber and allowed it free access to either compartment for 15 minutes. Nonobese mice spent most of this time in the compartment where they received the drug, indicating that the nicotine injections had given them pleasure they would like to repeat. However, obese mice showed no preference for the side associated with the drug. The investigators next examined the brains of the mice and found evidence that the animals maintained on a high-fat diet had less precursor associated with structures called mu-opioid receptors on cells in the ventral tegmental area (VTA) of the brain. The VTA is where nicotine acts to increase the availability of dopamine, a chemical that causes the pleasurable sensations associated with many drugs of abuse. Other animal research has implicated mu-opioid receptors in neurochemical processes that lead to nicotine addiction, and the finding that fewer of these receptors are activated in the brains of the high-fat-diet mice could in part explain their blunted response to nicotine's rewarding effect. "In this mouse study, the animals could not control their diet. But humans choose what and when to eat," says Dr. Allison Chausmer of NIDA's Division of Basic Neuroscience and Behavioral Research. "The observations made in these mice suggest a fascinating chain of events leading from a behavior, selecting what to eat, to a measurable biochemical change in the brain and altered response to an addictive drug. They illustrate the complexity of factors that contribute to the powerful addictive grip of tobacco and—conversely—can potentially be manipulated to improve the effectiveness of treatments that help smokers quit." Blendy, J.A., et al. Reduced nicotine reward in obesity: Cross-comparison in human and mouse. Psychopharmacology 180(2):306-315, 2005.